Pack 55 has boys and girls that belong to various Christian denominations as well as many other faiths. Most major religious groups sponsor religious awards, and Pack 55 encourages each family to participate in the program of that family's religious faith. For an index of the various religious award program, click HERE. Other faith groups offer similar programs targeted for the same age groups. For example, the equivalent programs to God & Me and the God & Family are called "Parvuli Dei" by the Catholic Church, "Aleph" by the Jewish faith, and "Saint George" and "Chi Rho" by the Eastern Orthodox Church. St. John the Divine Episcopal Church offers a series of meetings in which Tiger Cubs, Cub Scouts, and Webelos Scouts can earn the God & Me and the God & Family awards. These meetings are usually held in December and January of each year. For the Cubs who complete this program, the religious award is presented on Scout Sunday in February. Parents are strongly encouraged to attend the meetings with their Cub Scout as much of the training for the program actually occurs in the home and is based on the guidance provided at the meetings. The religious awards will be presented at Scout Sunday, February 17, 2019, at St John's 11:00a service. Troop 55 and Pack 55 will gather in front of the main sanctuary in advance of the service for photographs, and then will process into the service and be seated as a group. 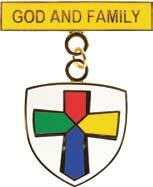 Cubs who have completed the God & Me award may start on the God & Family award in the Third Grade. The God & Me award is not a prerequisite for working on the God & Family award. There is a $30 fee for course materials and the medal.